The 2016 presidential campaign has highlighted the deep partisan divisions in the United States. A new Pew Research Center report finds that Republicans and Democrats now have more negative views of the opposing party than at any point in nearly a quarter century. These sentiments are not just limited to views of the parties and their policy proposals; they have a personal element as well. For Republicans, no single critique of Democrats stands out. 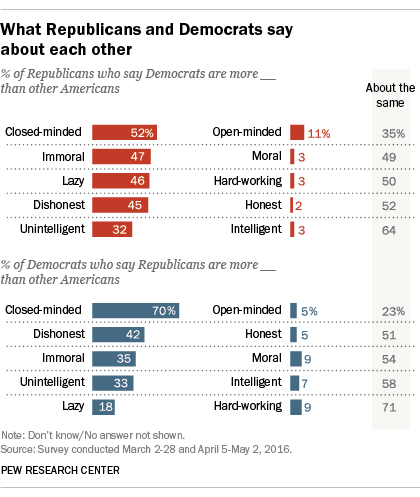 But about half of Republicans (52%) view Democrats as more closed-minded than other Americans, while nearly as many say Democrats are more immoral (47%), lazier (46%) and more dishonest (45%). Republicans also see the members of their own party as more hard-working (59%) and more moral (51%) than other Americans. 2In choosing a party, disliking the policies of opponents is almost as powerful a reason as liking the policies of one’s own party. Majorities of both Democrats (68%) and Republicans (64%) say a major reason they identify with their parties is that their policies are good for the country. But about as many – 62% of Democrats and 68% of Republicans – say a major reason is that the other party’s policies are bad for the country. For independents who lean toward the Democratic or Republican Party, negative factors far outweigh positive ones in their reasons for associating with a party, however loosely. More than half of Republican-leaning independents (55%) and 51% of Democratic leaners cite the harm caused by the opposing party’s policies as a major reason for their partisan leaning. Far fewer (30% of Republican leaners, 34% of Democratic leaners) cite the positive effects of their own party’s policies. 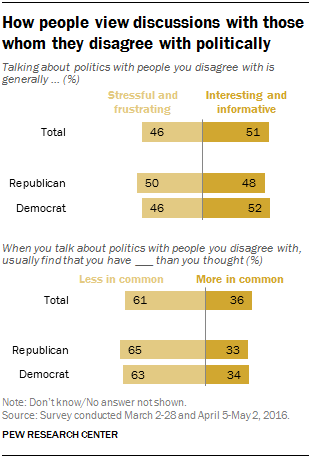 And comparable majorities in both parties – 65% of Republicans and 63% of Democrats – say that when they talk politics with those they disagree with, they find they have less in common politically than they thought. On the other hand, most partisans reject the idea that if people don’t agree when talking politics they won’t find common ground on other, nonpolitical topics. Identical shares of Republicans and Democrats (59% each) say that when people hold different views on politics, this doesn’t say a lot about how much they’ll agree about other topics. 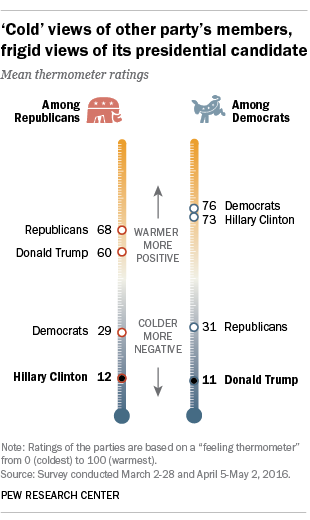 4 Partisans on both sides give “cold” ratings for members of the opposing party, “colder” ratings to that party’s 2016 candidate. Respondents were asked to rate a number of groups, including elected officials, military personnel and members of some religious groups, on a “feeling thermometer,” where 0 is the coldest, most negative rating and 100 represents the warmest, most positive rating. Democrats give Republicans an average rating of just 31, and Republicans give Democrats a similarly low rating of 29. 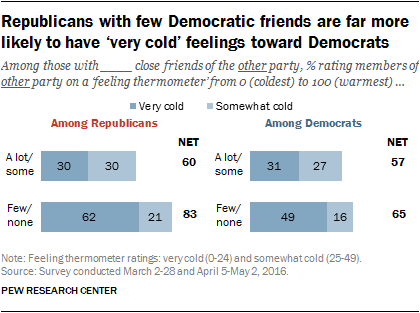 Democrats feel colder toward Republicans than they do toward any other group asked about. Even elected officials in Washington receive an average rating 15 degrees warmer than Republicans. Republicans rate Democrats (29) just as poorly as they do elected officials in Washington (30). Partisans’ ratings for the opposing parties’ presumptive presidential nominees are even colder. The average rating for Donald Trump among Democrats is 11 on the 0-100 scale; Hillary Clinton’s average rating is 12. 5 Having cross-party friendships is associated with how coldly partisans see the other party. Overall, Republicans and Democrats say they have more friends from their own party than the opposing party. Those who have at least some close friends in the other party tend to feel less coldly toward people in that party than those with few friends of the opposing party. This association between politically mixed friendships and views of the other party is most notable with Republicans. Fully 62% of Republicans with just a few or no Democratic friends feel very coldly toward Democrats. That compares with just 30% of Republicans who have at least some Democratic friends. And among Republicans, those who have close Democratic friends hold fewer negative stereotypes of Democrats than those who do not. Differences among Democrats are not as stark, but nearly half of Democrats (49%) with few or no Republican friends feel very coldly toward Republicans, compared with 31% of those with at least some friends from the other party. 6 For the first time in surveys dating to 1992, majorities in both parties express not just unfavorable but very unfavorable views of the other party. Today, 58% of Republicans have a very unfavorable impression of the Democratic Party, up from 46% in 2014 and just 32% during the 2008 election year. Among Democrats, highly negative views of the GOP have followed a similar trajectory – from 37% in 2008 to 43% in 2014 and 55% currently. Currently, 45% of Republicans view the Democratic Party’s policies as a threat, up from 37% in Pew Research Center’s 2014 study of political polarization. The share of Democrats regarding GOP policies as a threat has risen 10 percentage points (41% now, 31% then).